Many people still use the community solution called Send Email made by Travis Wright for Incident and later extended to Service Requests by Patrick Sundqvist. 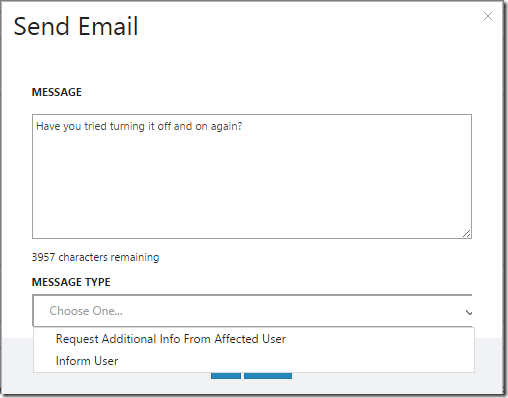 This allows the analyst to write a message to the Affected User or other related users on the Incident or Service Request and wrap the message in a nice email notification with prefilled information of your own choosing. 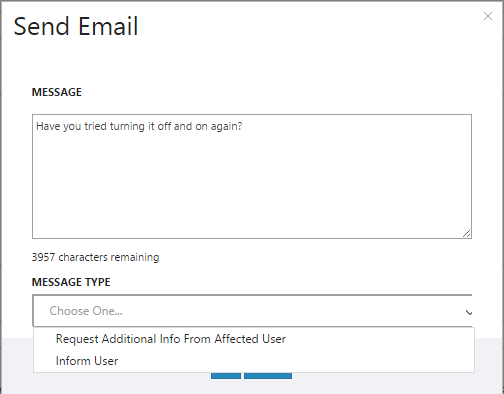 At the same time you can control what should happen to the Incident or Service Request after the email has been sent – for example if the Message type equals “Request Additional Information” then put the Incident in Status = “Pending User” so the analyst quickly can distinguish between the active and inactive Incidents. There are of course other more advanced send email alternatives out there to support attachments, CC etc. But the simplicity of this has made it very popular even today. The Action Log entry after sending the email is of type “Analyst Comment” and not “E-mail Sent”. The cireson API does not support the custom E-mail sent actionlog type yet unfortunately. From Cireson support: “Hello Morten, Unfortunately this is not a supported feature at this time. We would need you to submit a feature request to add this”. I’ll update the solution if I find a way to make it. Only support for Incidents at the moment. It can relatively easy be extended to Service Requests though. The js file also include code to hide the task for end-users and to set a default value if needed. looks like what I am looking for. Download link doesn’t work however.